2018 Good Hands Finals Planning is Underway! Planning is underway for The Good Hands National Finals 2018 and we are honored to welcome back our “Official Sponsor”, National Horseman Publishing. The Good Hands Final will be held at the Mid-America Horse Show Association (MAHSA) Mane Event Horse Show, October 23-26, at the Illinois State Fairgrounds in Springfield. This partnership allows for two historical entities from the Saddlebred community to come together to showcase and celebrate the beauty and precision of saddle seatequitation for the Junior Exhibitor and Adult riders. National Horseman Publishing, founded in 1865, has been an anchor in the Saddlebred community and the show horse world. 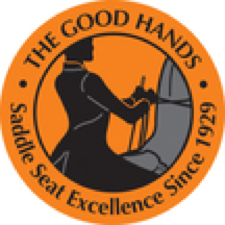 The Good Hands National Finalsis the oldest saddle seat equitation finals in the country. It dates back to 1929 and for many years was held at Madison Square Garden in New York City. In 2009, the Finals moved to the Mane Event Showand is now owned within our Saddlebred community by Mid-America Horse Show Association. The goal of Mid-America Horse Show Association, National Horseman Publishing and the Good Hands Finals committee is to build upon the traditions already set, to continue to grow the Finals and promote saddle seat equitation. The National Horsemansponsorship enables the committee to provide more incentives to qualified riders and to host the Friday night “Celebration of Champions” event, which spotlights the Good Hands riders for the entire community attending the show. The Good Hands Finals committee, comprised of Sharon Gardner, Jessica DeHart, Megan Dragich and Lindsay Shearman, welcomes back and is grateful for the continued partnership of Allison Lambert and the entire National Horseman Publishing team. For more information or to support The Good Hands Finalscontact Sharon Gardner-email, or (630) 738-0867.For information on the Mid-America Mane Event Horse Show,visit MAHSA-website. Thank you, Elisabeth Goth, for the Gold Level Sponsorship and support of equitation and its talented riders. You are always a constant in supporting our beloved breed, industry and saddle seat. Your kindness will assist, not only with the growth of this Final and division, but with supporting our next generation. In addition, to the Gold Level Sponsorship, Elisabeth, has set up a $1000 scholarship, which will be awarded to one lucky rider at the Good Hands Finals. We applaud and thank you for believing in the Good Hands Finals and our riders. This past year, our final has seen two major changes. First, it has a new owner: Mid-America Horse Show Association, and a new name: The Good Hands. Second, our final has a new facet entirely: the Good Hands Adult Finals. Throughout these changes, a constant for the Good Hands Finals has been the generous and fervent support of our official sponsor, the National Horseman. Allison Lambert and her amazing team have been a huge asset, bringing more creativity and innovation to our final than we could have hoped for since signing on with The Good Hands Finals in 2014. Not only has the National Horseman’s support helped this final flourish for the Junior Exhibitor riders, it has allowed us to grow to the point of offering the new Good Hands Adult Finals. This year, with the inaugural Good Hands Adult Finals, our committee hopes to once again prove The Good Hands worthy of its historic prestige. We also would like to recognize the incredible support offered to us–not only to our Good Hands Finals committee and the final itself, but most importantly of all to the exhibitors–by the National Horseman. It has been The Good Hands Finals committee’s personal pleasure to see each of The Good Hands qualified riders be given the opportunity to participate in National Horseman’s magazine as a group, showing once more the power of Saddle Seat Equitation in bringing competitors together as peers. Allison’s hands-on assistance has made this year’s expanded program a collaborative effort, bringing more minds, more ideas and more fun to the table for all! From all of us on the Good Hands committee and Mid-America, to Allison Lambert, her staff, and the National Horseman Magazine as an industry leading publication, thank you. Thank you for all we have and will accomplish together as a team! With an absurdly talented pool of 16 competitors, we still have no way of understanding just how our judges whittled it down to 10… luckily for everyone involved, they were able to and the finals went on to exceed all expectations! To get a closer look at how our nearly 50 qualified riders became a top ten, and then a Champion (Aleia Brown) check out The Contenders page. We are also hard at work, working on a top secret GH Project so keep your eyes out everybody! Exciting things to come! A dazzling crew of our competitors after the presentation of awards with our Champ and Reserve Champ! The Elisabeth Goth, LLC Scholarship went to Caroline Cherry, our 3rd Place Competitor! Posture. More than ever, adolescents are found slouching, crouching, and contorting their backs in ways that are extremely unhealthy! People are all going to have back braces by the time they are twenty years old if they don’t learn how to stand and sit up straight and walk with poise! It is, however, quite rare to see an equitation rider slouch on or off of a horse. All those rides with your shoulders tied back with a whip between your shoulder blades definitely have an effect on your posture in daily life. LIFE IS NOT FAIR. IT JUST ISN’T. Every single equitation rider out there has felt as though they were given an unjust ribbon, maybe even based entirely on their appearance. As heartless as it sounds, equitation teaches you how to deal with it. Hard work and dedication have always pulled through in equitation, not how pretty you are, or how much your horse is worth, but in those moments when someone’s (namely, the judge’s) opinion doesn’t swing your way, equitation will have taught you the confidence to feel sound in your ability, rather than cause you to crumble under the judgment of others. This is a once in a lifetime opportunity. Participation in the equitation finals is only for junior exhibitors, so do it while you can! Equitation is a great way to meet amazing people, to stretch your mental and physical capabilities, and to obtain a priceless connection with a horse that will (guaranteed) change your life. And lastly, for the performance riders out there who would still rather be on a flashy show horse: equitation will make you a better rider. Equitation will make it possible for you to ride any horse, no matter how crazy his eye’s are. The ability to feel what a horse needs, while navigating through a pattern, will undoubtedly allow you to maneuver and show your way through the best and most crowded of classes with ease and style. If that is not reason enough to practice equitation, then I do not know what is. Watch The Good Hands Final at ManeEvent Live! Artic Horse, an equestrian accessories provider, custom made 50 hair bows in three different styles for The Good Hands Finals qualified riders as an invitation to join in on the fun, the challenge, and the experience of the finals! Each qualified rider already has a bow in hand and is invited to wear those bows while competing, should they wish! Jodi Nelson, owner and hand-crafter of Artic Horse accessories, has a number of other products to offer GH Competitors! The Committee wants to thank Jodi for her beautiful bows and for helping our competitors ride in style! Below is a shot of two of the four gorgeous bow styles given to the riders at the 2014 Kentucky State Fair with their invitation packets. Amy’s Acres has generously sponsored a Wisconsin Wilderness vacation to a lucky Good Hands Participant where they can enjoy the quiet beauty of 155 acres in northeastern Wisconsin; just 30 minutes from the Wisconsin Dells! The winner of time in this lovely space will be drawn at the Evening of Champions Reception, Friday the 24th of October after the evening performance of the Mane Event Horse Show in the Artisan Building. Amy Weiler, owner of Amy’s Acres, is an avid competitor and supporter of the Saddlebred breed and industry. Her beautiful home boasts 6 bedrooms, 3 full baths, a formal dining room, washer and dryer, enough space for 12 guests, and stunning views of the surrounding area. It’s located 45 minutes from the gorgeous shops in Princeton where the lucky winner of this sponsorship can enjoy an afternoon shopping! The Good Hands Committee would like to thank Amy’s Acre for the generous sponsorship of this Finals.